Human Right Activist Irom Sharmila, who is undergoing a prolonged hunger strike, is allowed appear before a Trial Court in Delhi on May 27, 2014. Chief Judicial Magistrate Court at Imphal had given permission to her as the Delhi court had ordered her appearance in connection with her protest at Jantar Mantar. In 2006, she landed at Jantar Mantar in connection with her Hunger Strike and continued her fast in front of her supporters. But she is arrested since she continues the fast in front of her supporters. Anti-Armed Forces (Special Powers) Act activist Irom Sharmila is facing charges under Section 309 of the IPC (attempt to commit suicide). She has been on a fast since November 4, 2000 demanding repeal of the Armed Forces (Special Powers) Act 1958. On November 2, 2000, Assam Rifles, a sub-division of Indian Army, massacred 10 civilians standing at a bus-stop in what came to be known as “Malom Massacre”. 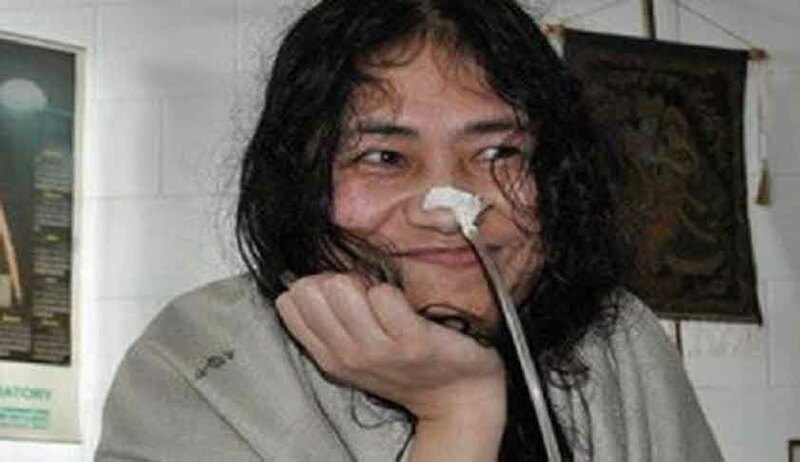 Since the day Irom Sharmila has been on fast she is only fed through nasogastric intubation to keep her alive. The Report of Justice Santosh Hegde Commission, set up by the Supreme Court in January 2013 to investigate cases of extrajudicial executions in Manipur, described the law as “a symbol of oppression, an object of hate and an instrument of discrimination and high-handedness. She has demanded to the Indian government to repeal the Armed Forces Special Powers Act (AFSPA) as it allows the central and the state governments to declare certain areas as ‘disturbed areas’ where army would have practically untrammelled powers of search and seizure, arresting, detaining, injuring and even killing people. Every year, Sharmila is arrested and detained even without filing a charge sheet and released by when her one-year jail term under Section 309 expires. But she will be re-arrested the next day or two days later as she continues her fast. This is a regular feature since she started her protest. As per the reports Sharmila denied the charge that she is trying to commit suicide. She said that she was using fast as a weapon to achieve her objective. Human Rights lawyer Mani Khaidem, who is appearing for Sharmila, has said that the repeated prosecution of Ms. Sharmila is unconstitutional and hence she should be unconditionally released. Amnesty International personal G Ananthapadmanabhan, is in a view that Sharmila should not be punished for exercising her constitutional rights and she be released immediately after dropping all charges against her. Report here. Sharmila is currently detained in the security ward of Jawaharlal Nehru Institute of Medical Sciences (JNIMS), close to her residence in Imphal East.